The robust flavor of wild sockeye salmon makes the fish incredibly versatile. Even though most people are quick to bake, poach, pan-fry or grill their fillets and serve it up as is, the truth is that there are so many different and unexpected ways to enjoy salmon. Whipping up a batch of creamy, wild salmon pâté is an incredibly simple way to have salmon on hand as a healthy and satisfying snack. All you really have to do is poach and process a fillet of salmon with a few other ingredients—in this case, coconut cream and leeks—and you have a spread fit for a casual afternoon or a cocktail party. This recipe freezes well, so make a big batch of pâté and freeze whatever you don’t think you’ll use in the next few days. Own a smoker or a grill? 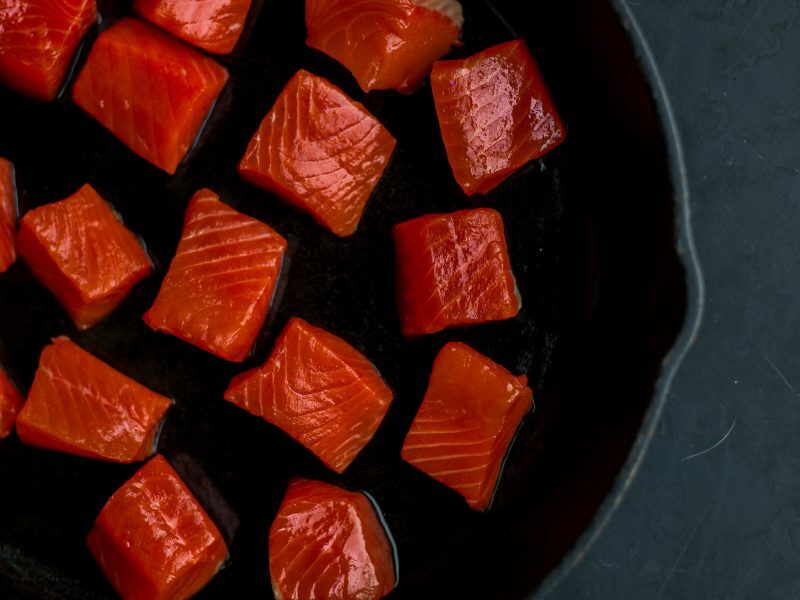 Then you can make salmon “candy” that is sweet, smokey, and perfectly chewy. After marinating wild salmon in a maple and brown sugar brine, you’ll smoke or grill these strips low and slow with some flavor-enhancing wood chips. Make more than you think you’ll need: salmon candy is binge-worthy. Feeling confident about your french cuisine skills? Poached wild salmon makes for an elegant and rich rendition of a classic soufflé. For these salmon ravioli in a creamy tomato sauce, you’ll want to make your pasta from scratch if at all possible—it’s not as challenging as it sounds. Or, if you can get your hands on good quality, fresh sheets of pasta, you can substitute those to make these as well. This recipe for salmon meatballs is gluten free, but if that’s not something you need in a recipe, you can swap out the coconut flour for regular breadcrumbs to bind the flakes of salmon together. Serve alongside a couple of sides and either some rice or bread (or even pasta!) to sop up the delicious garlic lemon cream sauce that accompanies these meatballs. Onigiri are classic comfort food in Japan. Freshly steamed rice is shaped around a filling—in this case, cooked salmon—then wrapped in a ribbon of nori. Furikake, the addictive sweet and salty Japanese seasoning, is what jazzes up this version of wild salmon onigiri. This twist on a deep-fried British favorite is so drool-worthy that it’s worth the extra effort to make. Grab a partner to help you with this one or save it for a rainy day. While none of the steps in this recipe are particularly complicated, there are several stages: blending spices, making salmon “sausage,” cooking the eggs, then assembling in baking the egg in a salmon sausage blanket until golden and crispy. Serve alongside good pickles and mustard.